December Holiday X'travaganza | Epic Fit Meals Co. The year-end holiday season is upon us and we would like to add to the fun and party! Yup, we are lauching our Year-end Holiday X’travaganza promo! You’ll get free EPiC Ozzie Wings with every delivery order. The more you order, the more Ozzie Wings you’ll get! Celebrate your holiday and say a Big Goodbye to 2018 in style and have some wings on us. Hurry, it’s valid until 2018 only! with any purchase above RM20. with any purchase above RM30. with any purchase above RM40. • Valid for online delivery order only. • You get 2pcs Ozzie Wings with minimum amount spent of RM20 in a single receipt. • You get 3pcs Ozzie Wings with minimum amount spent of RM30 in a single receipt. 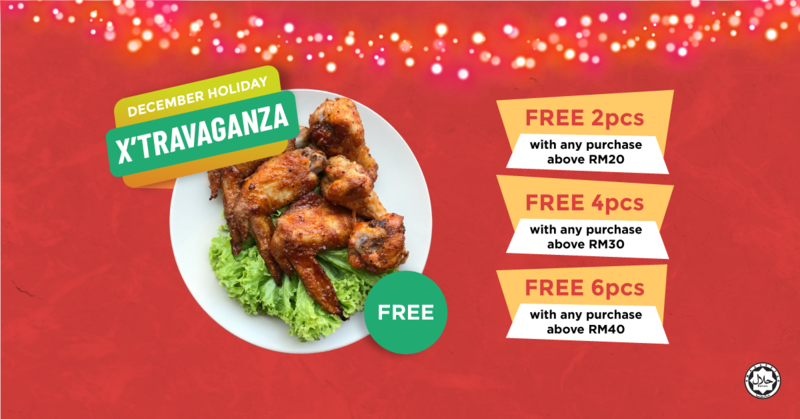 • You get 6pcs Ozzie Wings with minimum amount spent of RM40 in a single receipt. • Please input promo code when ordering online. No code no freebie! • Minimum order for delivery is RM20 exclusive of SST 6% in a single receipt. • We reserve the right to change the offer without prior notice.